Organized by the HKTDC, the Hong Kong International Wine & Spirits Fair will feature 1,075 exhibitors from 32 countries and regions, with about 70 events lined up. The fair will be held from 8-10 Nov (Thursday to Saturday) at the Hong Kong Convention and Exhibition Centre (HKCEC). The doors will open to the public on the last day of the fair (Saturday, 10 Nov), providing consumers with the chance to enhance their wine knowledge and experience the high spirits of Hong Kong's signature wine event. HKTDC Acting Executive Director Benjamin Chau said: "In the first eight months of this year, Hong Kong's wine imports - mainly from France, Australia, and the United Kingdom - reached HK$8.35 billion, a year-on-year increase of 10.5%. Imports from the United Kingdom and France recorded growth of 30.2% and 17.9%, respectively. Hong Kong's wine exports amounted to HK$2.66 billion during the period, with the Chinese mainland and Macau as the largest export markets, followed by Singapore and Taiwan." Following the Hong Kong Special Administrative Region Government's decision to eliminate all duty-related customs and administrative controls on wine in 2008, wine imports have seen a seven-fold leap - from HK$1.6 billion in 2007 to HK$12 billion in 2017. During this period, Hong Kong developed rapidly as a wine trading and distribution center, serving as a gateway for wines entering the mainland. Hong Kong has many advantages as a wine trading hub, with wine-related businesses - including auctions, retailing, catering, warehousing, and logistics - developing alongside wine trading and distribution. Since 2009, Hong Kong has become one of the world's largest wine auction centers, with sales topping US$98 million in 2017. According to Euromonitor International, consumer demand for wine in Asia and the mainland remains strong. It forecasts that between 2017 and 2022, wine sales in Asia will grow at 6.7% per annum. As a duty-free port with good air connectivity and excellent storage facilities, Hong Kong is globally recognized as the most cost-effective wine distribution hub. Wine merchants worldwide favor Hong Kong as a launch pad to expand their business into Asia and the mainland. 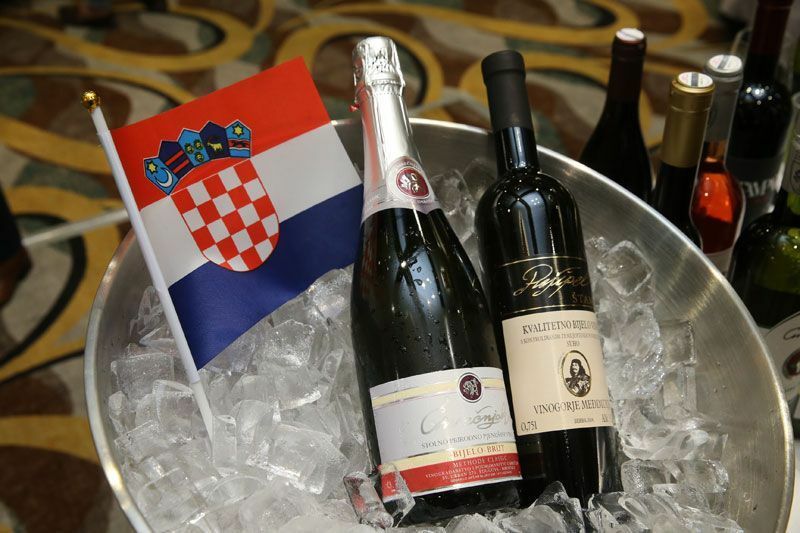 This year's Wine & Spirits Fair will feature 27 group pavilions from wine-producing regions, trade organizations and governmental organizations around the world. There will be new pavilions from the China Council for the Promotion of International Trade Sichuan Council, the mainland's Department of Commerce of Zhejiang Province, the Czech Grape and Wine Producer Association, Gifu Prefecture and the Niigata Sake Brewers' Association from Japan, and the Trade Commission of Peru in Hong Kong. The fair will also launch the World of Olive Oil at the Vinitaly pavilion to promote various kinds of premium olive oils, with visitors able to enrich their knowledge and sample a selection of olive oils. Also new is the Organic Wine and Spirits Corner that will feature a range of organically produced beverages for visitors to try. The fair will also feature a Liquor & Beverage Products zone, a Whisky and Spirits zone, and a Beer zone, together with zones that promote the industry's all-round development, including Wine Education, Wine Accessories, Equipment and Services and Wine Investment. Food-pairing products will be showcased in the Friends of Wine zone. Following a successful debut in 2017, the Asia Wine Academy, co-organised by the HKTDC and the Hong Kong Polytechnic University School of Hotel and Tourism Management, returns this year. On the theme of "Seeking Greatness: Decoding Wine Quality", Masters of Wine Jeannie Cho Lee and Sarah Heller will share their insights into Italian and French wines, exploring how wine style, regions, and production methods will affect wine quality, and teach methods for assessing wine. Participants who complete the courses will be awarded a certificate. The HKTDC will organize about 70 events during the fair, including more than 10 tasting sessions showcasing wines from around the world. It will also host numerous industry-exchange events, including a wine industry conference, thematic seminars, master classes, educational talks, a cocktail reception, and a gala dinner, providing a comprehensive business and exchange platform for industry players. At the Wine Industry Conference to be held on the first day, Master of Wine Debra Meiburg MW will host a session entitled "Driving Growth: The Flourishing Asia Wine Market". Speakers include Sarah Heller MW, Wainwright Advisors' Director David Wainwright, and Wines of South Africa Asia Market Manager Marcus Ford, who will share their insights on the prospects and trends for the wine industry in the Asian market. The last day of the Wine & Spirits Fair (10 Nov) will be open to members of the public aged 18 or above. Regular tickets will be priced at HK$200* and each ticket holder will receive a Lucaris crystal wine glass on a first-come, first-served basis while stocks last. The Hong Kong Wine Competition will be one of the main attractions on Public Day. Visitors can join seminars, wine tastings, and master classes, with whisky and cocktail demonstrations helping to enrich their drinks knowledge. Wine expert Stephen Mack, CEO and Principal Tutor of the Asia Wine Service and Education Centre will host two sessions: "An Introduction to Key Sake Styles" and "West-meeting-East: Comparing Wine & Sake". The fairground will also feature a wine-pairing station hosted by the International Culinary Institute to provide visitors with wine-and-food pairing experiences. This year, the HKTDC will once again organize the Hong Kong Wine Journey citywide promotion, putting together more than 90 wine-related activities in November. In addition to enjoying free corkage at selected restaurants, the public can take part in a series of wine tastings, themed tours and wine-pairing events, among others. For details, please refer to the Hong Kong Wine Journey map or the event website. From now until 9 Nov, members of the public can purchase Public Day tickets at a special price of HK$99 through HKTVmall, HOKOBUY, Yahoo, Price.com, Ticketflap, Clink Digital Media, Tap & Go wallet and the Octopus App (Octopus card or O! ePay). Ticket-buyers will receive a Lucaris crystal wine glass on a first-come, first-served basis while stocks last. Members of the public can enroll in the Asia Wine Academy at a special price of HK$690 (original price HK$990) through the Wine & Spirits Fair website, Octopus App or online platforms Timable and Ticketflap on or before 20 Oct. Participants will receive a complimentary Wine & Spirits Fair ticket and a Lucaris crystal wine glass - a package with a total value of HK$1,300 - on a first-come, first-served basis while stocks last.